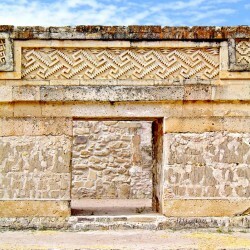 Without doubt, the most striking aspect of Mitla is the amazing geometric stepped-fret designs that adorn walls everywhere; both inside and outside, around doorways and lining entire walls. Their placement, particularly around the entrances to buildings, suggests they are designed to communicate to us some sort of meaning – such as who is allowed to enter the building, what will happen to those choose to enter, or what the purpose or significance of the building has. Fig. W0312: Building 2 – Each doorway has its own motif, perhaps describing the meaning of the doorway or the outcome of stepping through it. The mosaics are found on the internal and external walls of almost every building, including palaces, municipal buildings and within tombs. Because they feature on such a broad array of buildings and with only 6 or so different designs in total, it would seem their meaning must be fairly broad or very simple. However, the individual designs typically found together, normally stratified into horizontal bands using 3 different designs. This suggests they may have been creating compositions that bore new extended meanings, thus providing the potential for more than 100 permutations and a far more complex language. Fig. W0315: The Step-Fret Mosaics of Building 6 This isn’t the only hidden complexity, within the designs. From a distance, it would seem obvious that they would have been produced using moulds to set the shapes in plaster which were then glued to the wall. However, up close it is easy to see the shapes are individually carved from rock and slotted together like a jigsaw. Even closer inspection shows that these individual pieces were slotted together so tightly that they didn’t even require mortar. Most of the buildings are covered in plaster, so clearly they had the technology to make these patterns with moulds and chose the more complicated option deliberately. 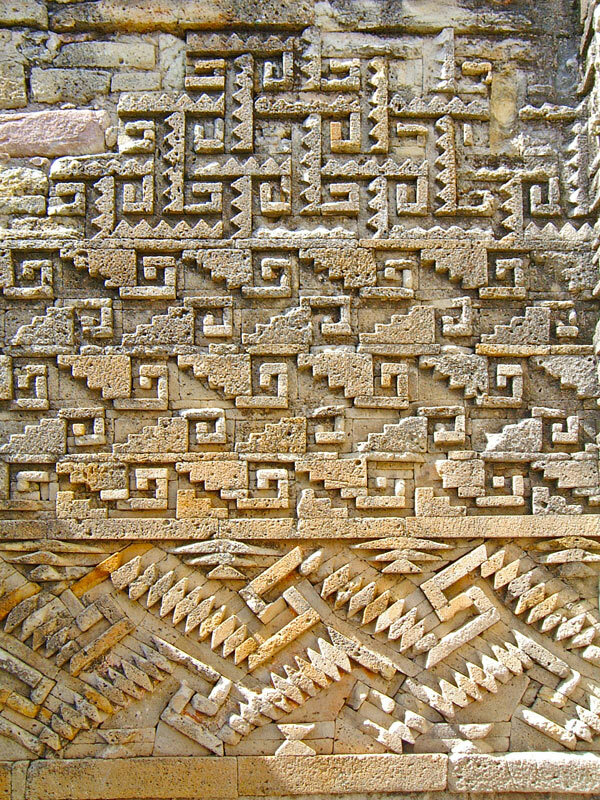 Even with today’s technology, including laser guided machine cutting, the scale on which this decorative technique is used at Mitla would make it prohibitively expensive. 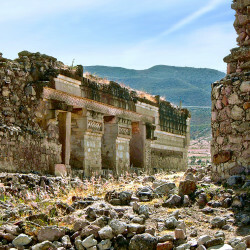 As the builders at Mitla had nothing more than chisels, hammers and man-power, it would have meant the cost of decorating each building would have outstripped the cost of building it by tenfold. So either there was a deeply religious or symbolic reason for using such a labour intensive technique, or it was used as a demonstration of wealth, power and opulence. 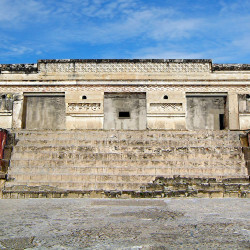 It is most likely the latter, and this tells us that the ruling elite of Mitla enjoyed broadcasting their supremacy through this lavish ornamentation and that the city was visited by Royalty and High-Priests from far and wide whom the city wished to impress. With such opulence built into the masonry of the buildings, it is almost certain that inside the furnishings and ornaments would have been equally lavish, and this may be the real reason why the city was dismantled by the Catholic missionaries and colonialists. 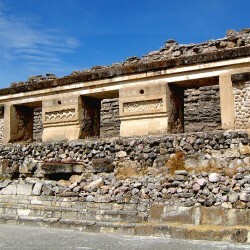 The interlocking stonework at Mitla can either be described as fretwork or mosaic – but it doesn’t fit precisely into either. 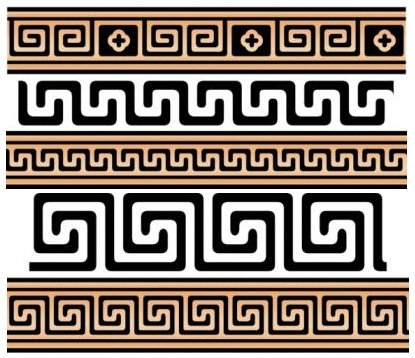 The designs are very similar to those used by the Romans, Greeks, Egyptians and Mesopotamian civilisations, which are known as step-fret or stepped-fret designs. At Mitla they are not simply Classic Greek Step-Fret Motifsdecorative though, and are thought to have religious significance – although the exact meaning of each shape is unkown. Most decipherments are based on simple associations with serpents or waves. More informed research suggests the round shape depicts the world, the wind or clouds; the “S” style shape represents the serpent, whilst the wave style depicts reincarnation with the steps leading down to the underworld then looping through a cycle and back to the top of the next stairs. There is surely more to be uncovered of their meanings and undoubtedly numerics will play a role in their decipherment – for example, the “wave” has five steps which normally corresponds to the number of planets visible to the naked eye. Also, is it the raised or the sunken part of the image that is supposed to be meaningful? The most elegant answer is that individually they are sacred symbols, but when used together they signify people, families, or tribes – like a coat of arms – and indicate who the building or tomb belonged to.